Enriched with Locsamhyo™, an optimized complex of ginseng and green tea, this first-ever skincare finisher promotes natural luminosity and skin clarity all day long. 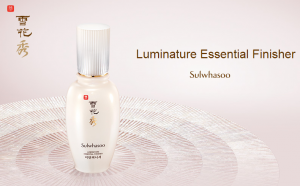 One bottle of Luminature Essential Finisher concentrates five roots of ginseng and the antioxidant benefits of 110 cups of green tea. Designed to seal in all benefits of previously applied products while creating a perfect canvas for makeup application. Natural radiance is instantly improved after a single use & continues to improves brightness, hydration and skin clarity with consistent use.